Why a Culture of Safety? Healthcare leaders are guided by the highest calling: to care for those who entrust their care to us. To make a difference. We believe this can only happen when leaders lead with intent. Leading with intent requires that leaders stand for something. Amidst all of the competing priorities, the most important thing that leaders can stand for is safety – that leaders lead for safety. 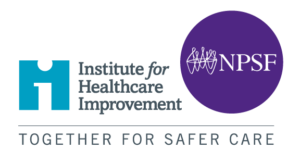 The American College of Healthcare Executives (ACHE) and the Institute for Healthcare Improvement/National Patient Safety Foundation Lucian Leape Institute (IHI/NPSF LLI) have partnered to help healthcare leaders lead for safety through creating and sustaining a culture of safety. As you know, leading for safety is a journey—it’s a marathon and not a sprint! There are many highs and lows on this journey. Sometimes things are moving forward and other times a little reboot can be helpful. This site provides you and your leadership team with practices to develop your team and to keep moving forward on this critical journey. Creating a culture of safety in healthcare settings is a challenging endeavor. Until now, there have not been clear roadmaps for organizational leaders to take in developing such a culture. So, we collaborated with leaders of progressive healthcare organizations and globally renowned experts in leadership, safety, and culture to develop the resource, Leading a Culture of Safety: A Blueprint for Success. The Blueprint gives CEOs and senior leaders a tool to both assess and advance their organization’s culture of safety. Through systematic, small steps, this process of improvement becomes a motivating experience, rather than an overwhelming one. The Blueprint outlines clear strategies and tactics that can help inform dialogue with Board members and leadership teams, help executives establish priorities, and encourage accountability and follow-up actions. Improving healthcare safety requires leaders who are committed and take a stand to achieve the highest standards of safety. Strong leadership involves balancing core values while consistently raising the bar for excellence. ACHE’s leadership development expertise coupled with the IHI/NPSF’s in-depth insight on safety practices, offers healthcare leaders the foundational tools to measure, build and sustain a culture of safety in the workplace. Join us as WE LEAD FOR SAFETY! Commit to leading for safety by signing our We Lead for Safety pledge and receive a Leading For Safety certificate. Assess Your Safety Culture by taking this self-assessment. Once you take the pledge to commit to a culture of safety and assess your current safety measures, we will continue to provide you with scalable steps and guideposts on the path to major progress. The Blueprint contains best practices and guidance to help you choose your first action steps. And, we will continue to provide timely information, tools and resources that support your commitment to safety.